Mountain Crest Gardens is a family owned and operated succulent nursery, nestled in the mountains of far Northern California. Our history is long and winding, and it began in 1995 when our President and Founder, Tom Jopson, decided to diversify his business. A nurseryman with an established conifer tree seedling business called Cal Forest Nurseries, Tom was ready to try adding something entirely different to his greenhouses. In the early days, Mountain Crest Gardens shared space with our sister nurseries, which grew conifers and flowers. Inspired by an employee’s beautiful rock garden, Tom purchased a large collection of hardy Sempervivum and Sedum from the Russ family of nearby Igo, California. The Russes had been passionate collectors and cultivators for decades and had amassed one of the nation’s most extensive collections of hardy succulent species and cultivars. Initially, the succulents were merely used to fill in flower arrangements, but they eventually grew into their own, succulent-focused business. FUN FACT: Sempervivum heuffelii ‘Irene’, one of our best-selling varieties, is named after Irene Russ. With Mountain Crest Gardens, Tom wanted to continue what the Russes began – providing exceptional, hardy succulents directly to collectors and rock garden enthusiasts across the country. At first, our plants were only available through a mail order catalog. FUN FACT: The name Mountain Crest was inspired by Snow Crest, a local Internet provider based in Mount Shasta. The name reflects our hardy succulent origins. Tom knew these plants had many possible uses, especially as outdoor container gardens. He started a line of pre-planted “dish gardens” using hardy succulents and well-draining hyper-tufa containers. 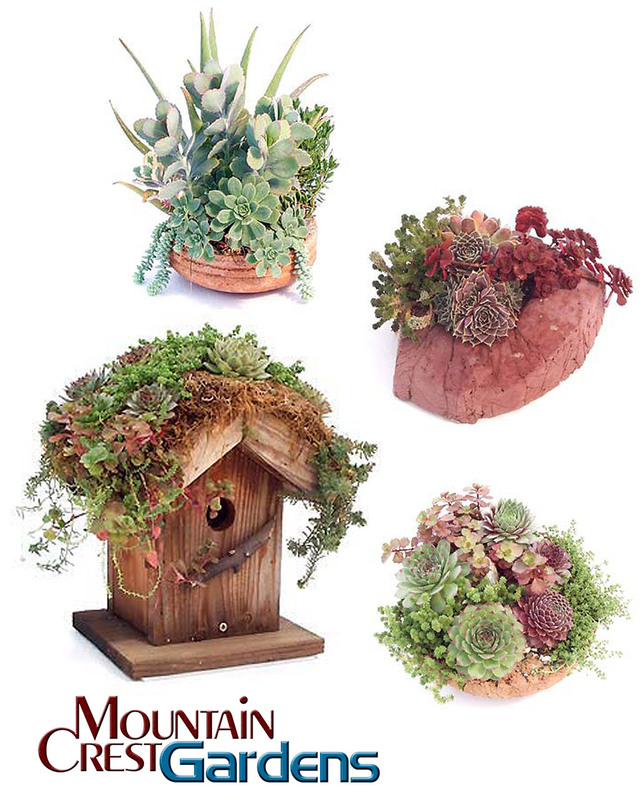 Wooden birdhouses with succulent roofs were also developed, along with lava rock planters. 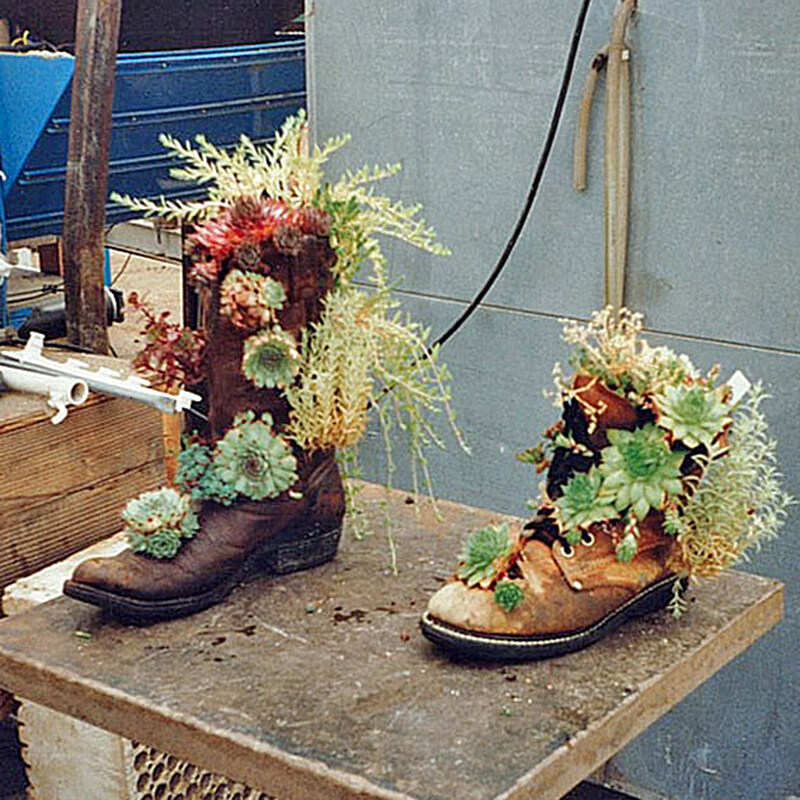 Old leather boots planted up with semps were some of the first MCG “creations”, though the concept was ultimately too challenging to ship. 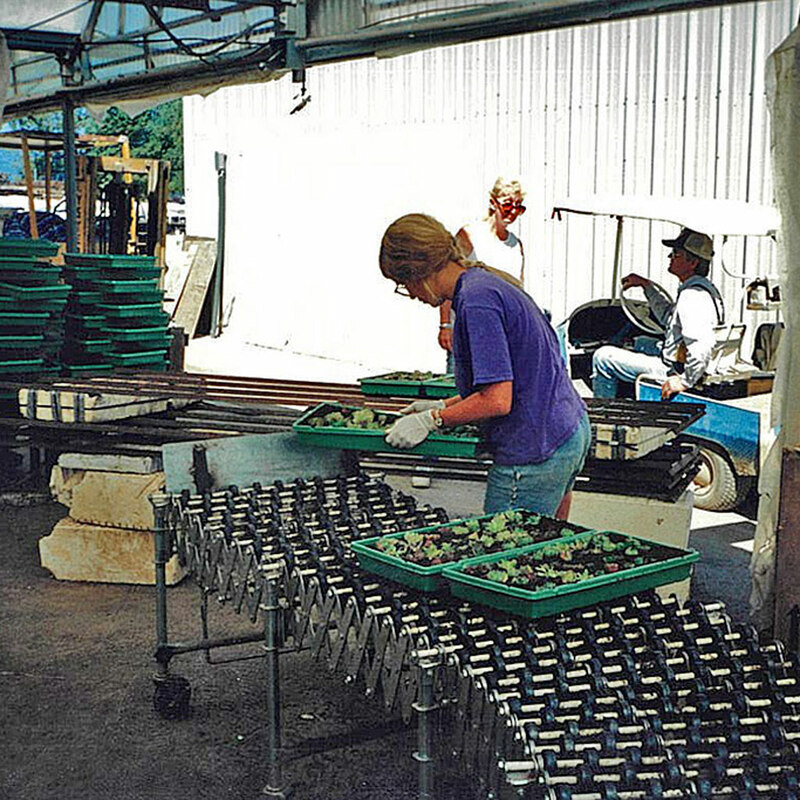 Three hard-working women carried out the entire production and shipping process: they propagated new succulents, grew them to size, crafted hyper-tufa containers, planted arrangements, and shipped them out. 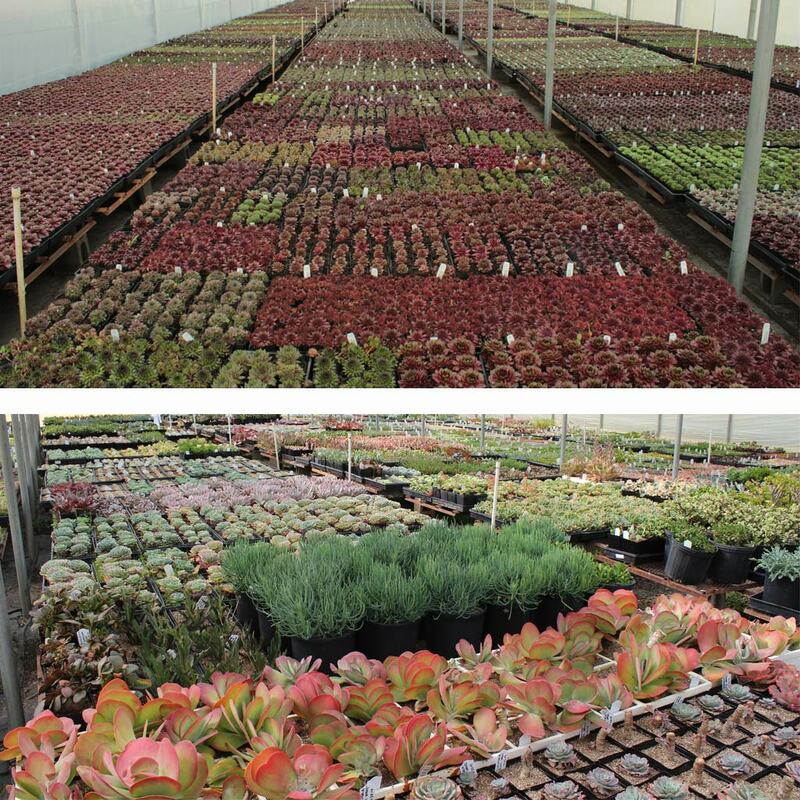 Through the nineties, we sold our pre-planted succulent gifts wholesale through big box retailers on the west coast, but it wasn’t long until challenges arose. Many of the retailers didn’t care for the plants properly and succulents would get stuck in warehouses for weeks at a time. We eventually decided to skip the “middle man” and sell our succulent creations directly to customers. FUN FACT: Tom’s son, Matts, created Mountain Crest Gardens' first informational website in 1999 while in high school. Our online store launched three years later, under the name "MC Garden Gifts". Though individual succulents were offered online, the focus was still pre-planted "gift" products such as dish gardens and birdhouse gardens. However, by 2005 we realized that our customers really cared more about the plants themselves, rather than finished gift products. Our mission had become clear: grow the widest selection of high quality, named succulents and deliver them nationwide, in every season. With that, we discontinued MC Garden Gifts and relaunched the online store as Mountain Crest Gardens. Our succulent collection began to expand beyond hardy succulents into soft varieties, including Echeveria and Crassula. We also introduced the web’s first direct-to-consumer bulk succulent flats: Sempervivum and Sedum Plug Trays. These were, and continue to be, the most affordable way to bring home top quality rooted succulents. The MCG collection continued to grow over the next decade, with dozens of soft and hardy succulent varieties added each year. Business remained slow and steady and we operated at a small scale, meeting the needs of a dedicated customer base. 2006: Author Debra Lee Baldwin publishes her first book, Designing with Succulents, which is largely credited for kick-starting the rise in popularity of succulent plants. 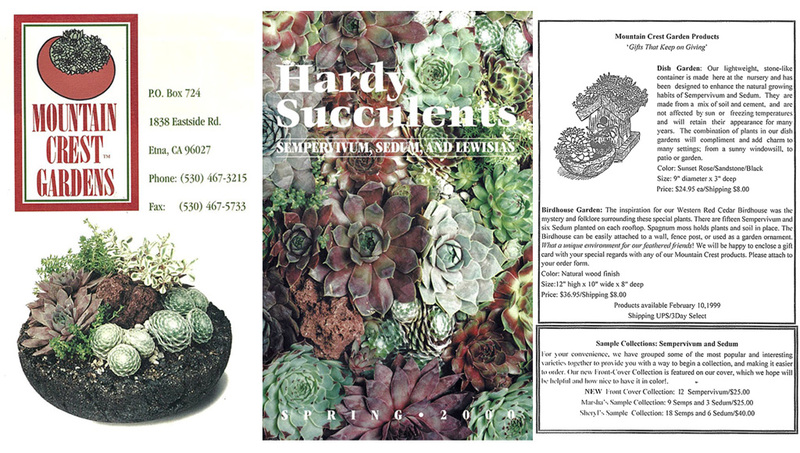 Her subsequent books Succulent Container Gardens and Succulents Simplified continued to solidify succulents in the public consciousness. 2010: Pinterest & Instagram launch; these visual social media platforms would go on to transform succulents into Internet sensations. 2011: Prolonged droughts begin in the western US, bringing even more attention to succulents and other low-water plants. 2013: Succulents and Sunshine is launched by Cassidy Tuttle, and quickly becomes the web’s premiere destination for easy to read succulent care guides. 2014: MCG acquires the Abbey Garden collection of exotic Haworthia and Gasteria from lifelong succulent collector Lem Higgs. 2014 was the year when everything started to change rapidly; MCG became a true family operated business when Tom's son, Matts, joined as Vice President. Air Plants and rare Haworthia species were introduced in 2015, followed by significant greenhouse, staff, and product line expansions in 2016. That year also brought the introduction of premium pots and the Rivet Works customer photo collector tool, which allowed us and the world to see how customers actually use their succulents (every way imaginable, it turns out!). In 2017, a partnership was formed with Waterwise Botanicals to introduce their unique blooming Opuntia cactus and other exotic succulent cuttings to the web. A brand new fully custom online store was launched in October 2017. MCG’s collection now includes over 700 species and cultivars of soft and hardy succulents. Dozens of full-time employees are committed to growing and shipping the best succulents available, along with providing friendly & knowledgeable customer service. We're continually expanding our collection, enhancing our website with better content, and serving a wonderful community of succulent lovers in every corner of the US. We deeply appreciate our customers' support as it drives us to explore new ways to get healthy, beautiful succulents in as many homes, offices, and gardens as possible. Thank you for 24 amazing years (and counting)!